Located between Myrtle Beach and Conway, Carolina Forest is an unincorporated community stretching from the Intracoastal Waterway west into Horry County. Any drive into Myrtle Beach on 501 or Highway 31 passes along the outskirts of this vibrant growing community. Home to golf courses, shopping and award-winning restaurants the Carolina Forest area is a short fifteen-minute drive from the oceanfront. Spend the morning at an area golf course such as The Man O&apos; War Golf Club, The Wizard Golf Links, Myrtle Beach National on the west end of Carolina Forest or River Oaks Golf Plantation. Shop the day away at Tanger Outlets on Highway 501, adjacent to Carolina Forest and Myrtle Beach Speedway. For lunch or dinner, don&apos;t miss Longbeard&apos;s Bar and Grill or Brother Shuckers Fish House located on River Oaks Drive close to Robert Grissom Parkway. Close to Highway 501? King Kong Sushi Bar right off Carolina Forest Blvd. offers an award winning menu sure to delight! The Carolina Forest residential area had grown exponentially over the last decade with national builders developing subdivisions west of the Intracoastal Waterway (ICW) to accommodate an influx of new residents seeking great year-round weather, low taxes, award winning schools and plentiful job opportunities. Home to single family housing, apartment complexes, long term rentals, condos, townhomes and luxury estates, there are housing options for anyone looking to relocate to area. As the area continues to grow, the amenities continue to grow as well with new schools being built, the addition of a full-service library, recreational center and more! 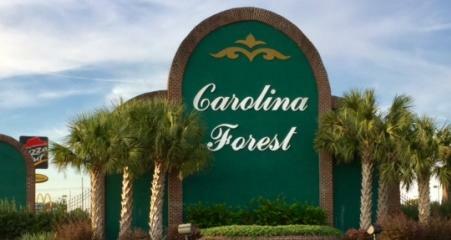 On your next drive to the Myrtle Beach area, make a stop in Carolina Forest to shop, dine or explore! For relocation information visit ThinkMyrtleBeach.com. For dining options, visit GrandStrandRestaurants.com!